After four months of blogging, I've reached 100 followers. It's a small milestone to some, but coming in with little experience and few connections, it's major to me. And it can be major to you too if you win! The prize is the Color Club Foiled collection (including a shiny top coat). I've swatched the collection here. There are a few rules, so please take the time to read them all so your entry will be counted correctly. Due to postal rules and regulations, I can only open this giveaway to U.S. addresses. I tried to find a way around this that wouldn't put me in jeopardy with the law, but I haven't had any luck. I'm so sorry to my international followers and friends. All entries are due by January 31, 2012 5:00 PM (MST-Colorado time). Everyone who follows my blog publicly is welcome to enter, including new followers! Posting about the giveaway on your own blog, Tumblr account, or Twitter account! Feel free to use the graphic below for posting on your blog or Tumblr, and the Tweet below for Twitter. Tweet: @blognailedit is having a giveaway! 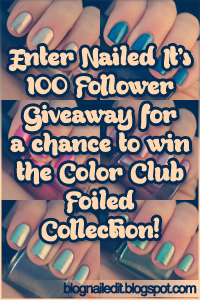 Visit http://blognailedit.blogspot.com for a chance to win the Color Club Foiled collection! The winner must respond to an email I send them informing them of their win within 48 hours of the email being sent. A new winner will be chosen if a response is not sent. I will not choose the winner; random.org will select the winner based on the number of entries. Enter by using the form below. Comment entries will not be counted. Thank you so much for following and sharing your thoughts! I've enjoyed growing from everything, and will continue to do so! This blog is special to me, and you guys are the reason I continue to post in it! congrats on your followers thats awesome! @♥beauxs mom Thank you! And thank you for following!